Due to uncertainties in determining the geotechnical parameters, it is inevitable to change the supporting system and excavation method during the tunnel construction projects. Such changes will in many cases lead to an increase in the foreseen time and cost. Since the beginning of the 1960s, value engineering (V.E.) was raised based on three principles of safety, cost optimization and sustainable design. Iraqi Kurdistan has had an increasing trend in design and implementation of development projects since 2008, but high safety factors considered to compensate for uncertainties in geotechnical parameters has imposed high construction costs to these projects. The design of more than 70 km of tunnels, 212 dams and more than 500 km of highways under construction in this region necessitates performing applicable case studies on the implementation of V.E. in these development projects. The Heybat Sultan twin tunnels project is being constructed as a part of the Erbil–Koya–Sulaymaniyah highway in Iraqi Kurdistan. Preliminary studies showed that the outlet portals of these tunnels had been designed with a high factor of safety. Hence, the decision was made to make changes based on V.E. principles prior to the commencement of the excavations and at the time of site mobilization. For this purpose, the most optimal method statement was selected for the outlet portal, and then the slope stability was evaluated using numerical analysis. By implementing the optimized design, the factor of safety was increased from 1.27 to 2.48 and the corresponding construction costs was decreased for 2.4 million USD compared to the original plan. Value engineering (V.E.) is a set of systematic and applicable techniques which are used to detect the function of a product at a minimum cost. This technique is utilized to reduce the project construction cost taking into consideration the minimum acceptable factor of safety. By use of the value engineering methodology, it would be possible to study different aspects of the project, and ultimately improve the quality, and reduce the construction costs and duration on the team work basis, with a creative manner and within a short period of time. Geotechnical designs are mainly based on limited and uncertain data resulted from field investigations and laboratory test results. Such a nature leads to high safety factors, and consequently, increase of the construction costs. In general, by using value engineering in a project, three advantages, including design review, quality control (QC) and cost saving will be obtained. 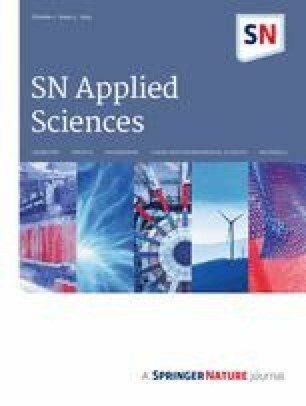 Limited studies on value engineering in development projects have been carried out since the late 1980s among which Brahma , Liew , Naderpajouh and Afshar , Mao et al. , Lee et al. , Khademi and Beheshti , Tang and Bittner , Katzenbach et al. , Zetterlund et al. , Khezeli and Rahai , Heralova , Mousakhani et al. and Taromi et al. can be addressed. Tang and Bittner  studied using V.E. for marine construction projects. They discusses a number of challenging limitations in many marine construction projects, and then presents a ten-step procedure based on previous projects for solving them. 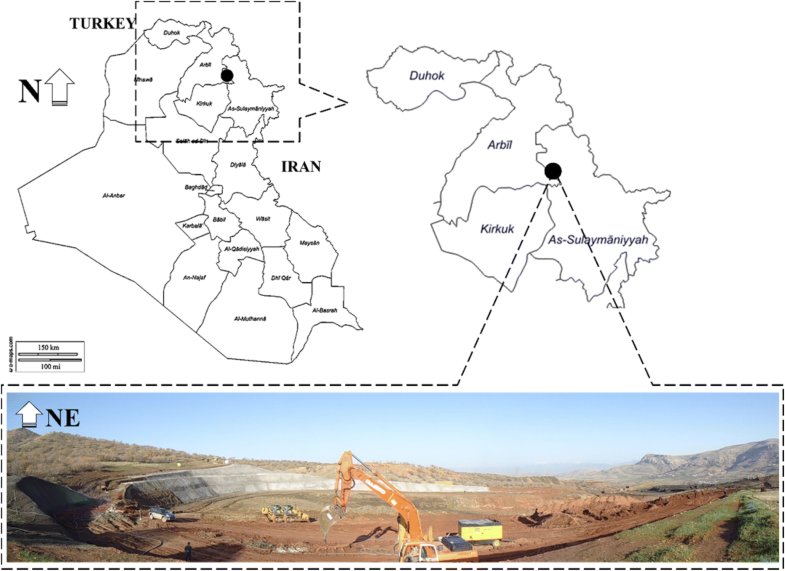 Khademi and Beheshti  applied the principles of value engineering underpass of Gachsaran Geological Formation. Zetterlund et al. developed a topic entitled value of information analysis (VOIA) based on the principles of value engineering for decision making on the field investigations strategy. 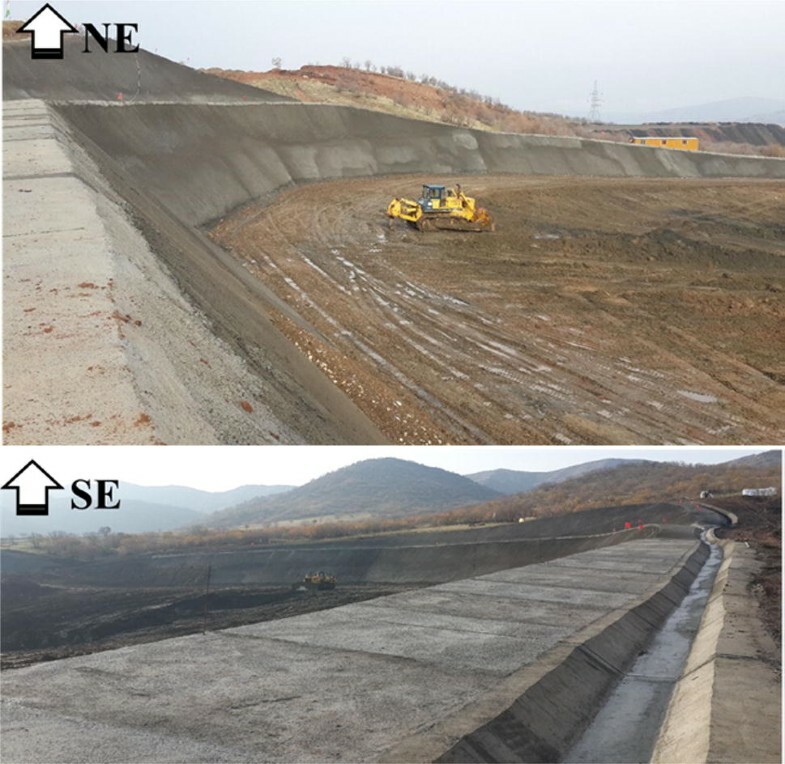 Khezeli and Rahai  implemented a value engineering technique to optimize the supporting system and the slopes stability of Ezgeleh Dam. By implementing the foregoing value engineering technique, they reduced the cost and time for 51,000 USD and 32 days respectively. Development projects such as the design of 212 dams, over 70 km of road tunnel and more than 500 km of highways have had an increasing trend in Iraqi Kurdistan since 2008. High safety factors are substantially considered in Iraqi Kurdistan development plans, especially in tunneling projects. Insufficient studies and lack of value engineering principles in the work plan of the local experts necessitated emphasizing on the steps and how to implement the value engineering in the development projects. This paper represents the process of implementing value engineering at the outlet portal of Heybat Sultan twin tunnels. By the implementation of this procedure, the safety factor was increased from 1.27 to 2.48, and the associated construction costs was reduced for 2.4 million USD compared to the initial plan. The project of Heybat Sultan tunnels is being implemented in the Northeast of Iraq—the Kurdistan region—and in 5 km from the Koya (Fig. 1). The length of these horseshoe shape tunnels is 2 × 2600 m with an area of 110 m2. The main objective of this project is to remove the mountain pass of Heybat Sultan and to construct the Erbil–Koya–Sulaymaniyah highway. The study area is located in Zagros high folded zone from sedimentary-structural classification point of view . Due to the specific tectonic conditions, this area consists of the crushed rock masses of gypsum, limestone, mudstone, sandstone, shale and marlstone. In accordance with the surface geological mapping, there are 3 to 4 joint sets in this area. The surface of the joints is smooth and their infilling is mainly clay and calcite. In the middle part of the tunnel, the Flysch structure is observed as a combination of sandstone beds and shale and siltstone interbeds. High anisotropy, heterogeneity and low permeability are considered as specific features of this kind of structure . Based on the rock mass rating classification (RMR), this area was divided into six blocks according to Fig. 2. After performing laboratory tests and geological surface mapping, the geotechnical properties of different blocks were determined according to Table 1. According to the geomechanical classification, the host rock mass is classified as poor class . The host rock/soil of the outlet portal consists of green to gray shale, claystone and clayey silt with some sand and gravel (Fig. 3). Tanjero is the host geological formation of the outlet portal which belongs to the Late Cretaceous epoch; it covers 578 m of the tunnel route. According to geological surface mapping and the boreholes drilled in the study area, the groundwater level in the outlet portal is below the tunnel level. In the initial plan, the supporting system of the outlet portal included the implementation of a 20 cm shotcrete reinforced with two layers of Q295/295 welded wire mesh, 6 and 12 m long soil nails in 32 mm diameter, 6 m long rock bolts with a diameter of 28 mm and pattern of 1.5 × 1 m. The bench dip is 3(V):2(H) and their height from top to bottom is 11, 10 and 15 m respectively. At the phase of production, no prejudice should be involved in the idea. All possible solutions, even those that are apparently not applicable, should be taken into consideration. According to Singh et al. , implementation of a value engineering will have more benefits in the project preliminary phases, and would lead to lower costs (Fig. 4). 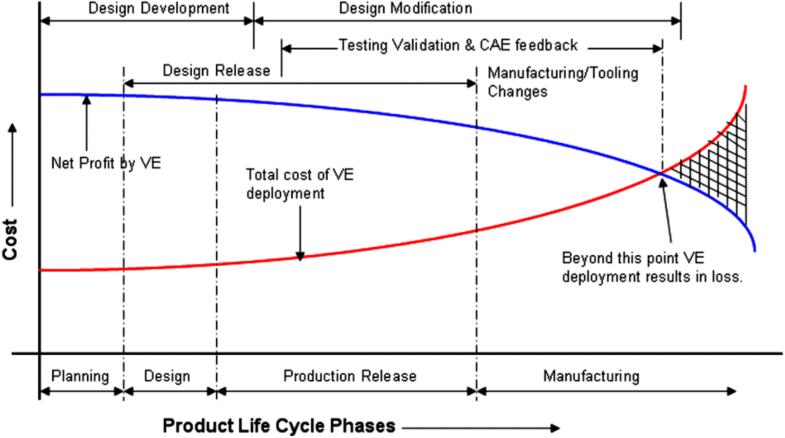 In general, the effect of value engineering on the project diminishes over time. At some phase of the project life (construction phase), the cost of value engineering is higher than its benefits so that the implementation of the value engineering would not be justifiable from the economical point of view. In accordance with the principles stated in the standards, the value engineering at the outlet portal was implemented in six basic stages according to Fig. 5. Phase I (information): The first point in the value engineering is to identify the items that their quality can be improved and their costs can be reduced by making some modifications. In this phase, data collection and recognizing the need for changes were commenced by studying maps and focusing on changeable items. The studies showed that the outlet port can be improved both technically and economically by making changes in the slope of the benches and the supporting system. Phase II (Function analysis): In the second phase, decisions are made on the basic and secondary activities according to the information obtained from the previous phase. In this phase, it is necessary to answer some questions as: what is the goal? How long does it take? How much does it cost? And is there any other solution to achieve this goal? The supporting system is implemented in the outlet port to stabilize this structure. According to the initial plan, the minimum time required for implementing the portal will be 6 months, and it will have a cost about 4.9 million USD. After reviewing different aspects, three following strategies were suggested to be replaced with the original plan. Phase III (Creativity): At this phase, several meetings were held on the items nominated for change, on the scope of their changes and on the volumes of each of them. This phase should be accompanied by the agreement and creativity of the experts. At this phase, various aspects of the proposed alternatives are discussed in brainstorming sessions. After reviewing the different alternatives, the Alternative (2) was selected as the plan stated in Table 2 for further assessments. In the proposed alternative, it was tried as much as possible that the stability of the side slopes was achieved by reducing the slopes. To this regard, it was proposed to change the slope from 3 (V): 2 (H) to 1 (V):1(H). As a result of this option, the cutting volume has been increased by 74,996 m3. Although one of the negative aspects of the proposed alternative is an increase in the volume of the cut and the length of the tunnel, but this is taken into account with some advantages, such as increased stability, reduced construction time and a quick transition to the excavation stage. According to estimates, the implementation of the portal based on the original plan takes about 6 months. In this case, due to weather effects caused by rainfall occurring within 4 months of the year, and the high PI of the clayey soils of the study area, the construction works will face many problems and would have low progress rate. Therefore, the costs related to the increase in the excavation volumes and the tunnel length were estimated less than those caused by bad weather conditions in open areas. It should be noted that if the plan is not accepted at this phase, it is necessary to return to the phase II and consider another alternative. 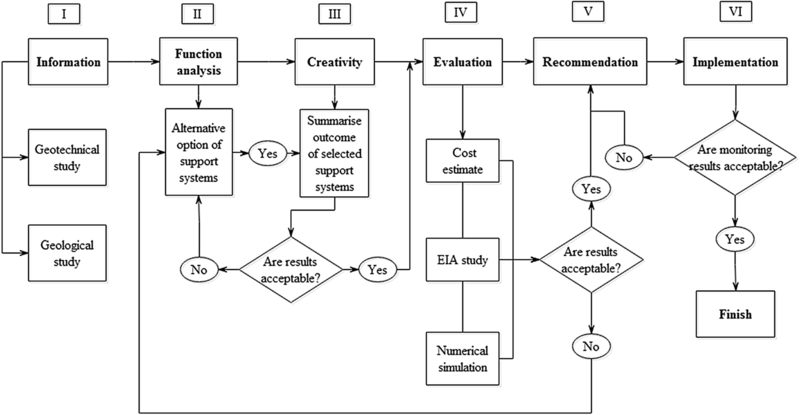 In phase IV (evaluation), three major issues including cost estimate and comparison between the cost estimated with the original design, environmental impact assessment and numerical analysis should be taken into consideration. According to Table 3, the selected alternative costs were compared with the initial design costs based on the bill of quantity (B.O.Q.). The results showed that by implementing the proposed alternative, the construction costs of the portal would be decreased to about 2.4 million USD. The environmental impact studies also showed that the proposed plan would give rise to an inconsiderable damage to the environment. Besides, the results of the numerical analysis referred to in Sect. 4, indicate that the proposed plan is acceptable. In this phase, if the results are not accepted, it would be necessary to go back to the second phase and consider another alternative. Phase V (Recommendation): At this phase, some suggestions such as how to allocate machinery and logistics will be discussed so that the facilities necessary to construct the project are identified and provided. After this phase, the plan will enter the construction phase. At this phase, monitoring is a critical requirement and the success of the implementation of the plan is subject to monitoring. Numerical modeling is required to determine the amount of deformation and the stability of the proposed alternative. The required geomechanical data for numerical simulation were obtained from 3 boreholes in 10 m length which is drilled in the portal. Disturbed and undisturbed soil samples were obtained at different depths using split spoon and Shelby tube samplers. According to record of results and bore logs, soil profile in the boreholes consists of mainly clayey silt with some sand and gravel (Fig. 6). The percent of these constituents differs at different depths and locations of the boreholes. After conducting lab tests, the geotechnical properties of the outlet portal was determined according to Table 4. The FLAC finite difference code was used to the simulation of the portal side slopes. Dimensions of the model were considered as 125 × 41 m and the constitutive model was simulated by Mohr–Coulomb failure criterion. Excavation of the benches was considered step-by-step by reducing the slope of the benches from 3:2 (56°) to 1:1 (45°) with the same heights as in the original design (Fig. 7). The failure strain criterion was used to evaluate the stability of the proposed plan. By performing different tests on different rock and soil samples, Daraei and Zare  presented three levels of stable, critical and collapsing for the geotechnical materials. The calculated failure strain of higher than Eq. 1 means collapse, if it is between Eqs. 1 and 2, it is critical, and if it is less than Eq. 2, it is stable. The results depict that the failure strain of the host rock of the outlet portal is equal to 1.988 × 10−3. The comparison between this value and the Eqs. 1 and 2 shows that the outlet port will be stable by the implementation of the proposed plan. where Mod.Esec is modified secant modulus (kg/cm2), ɛf is failure strain. It should be noted that the modified secant modulus is 0.88 of the tangent modulus . The safety factor can be expressed as the ratio between the calculated strain from the numerical model and the obtained failure strain from Eq. 2. Thus, this value will be equal to 2.84, which has increased by 1.57 compared to the original plan (1.27). It should be mentioned that the FLAC will result in a critical shear strain, which should first be converted to a critical strain by Eq. 3, and then converted to a failure strain using Eq. 4.
where ɛc is critical strain and γc is critical shear strain and υ is Poisson’s ratio. The results of numerical analysis show that the outlet portal side slopes will become stable by changing the side slope angle. However, a 10 cm thick shotcrete reinforced by one layer of welded wire mesh (Q221/221) was proposed to prevent weathering and piping, which is mainly caused by precipitation in clayey areas. Horizontal displacement changes after excavation are important parameters in the slopes stability. 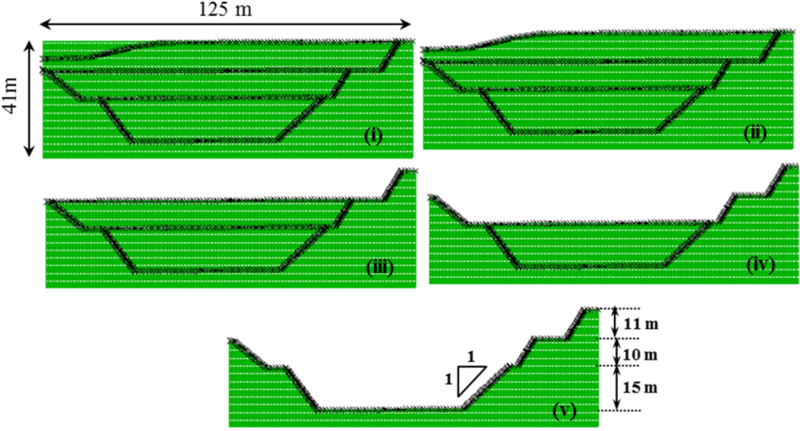 Figure 8 shows that the horizontal displacement in the third side benches is greater due to the presence of silty and clayey interbeds. The minimum displacement is in the first bench on the right and the maximum displacement is in the third bench on the right side. As seen in Fig. 8, due to the vertical stress caused by the upper beds, more displacement changes have occurred in the toe of the benches. According to Fig. 9, one of the important points that should be taken into consideration is the lack of proper bonding between the shotcrete and the clayey rock surfaces, especially in the presence of water. In the initial plan, the shotcrete had only been considered on slopes. But in order to prevent the water from penetrating into the space behind the shotcrete and to provide proper bonding between the shotcrete and the clayey surfaces, it was suggested to place a 10 cm thick concrete layer in berms reinforced with a layer of welded wire mesh and to have it overlapped with the front and back benches as seen Fig. 10. Such a technique will have two major advantages: (1) the benches will act integrally against the imposed forces; and (2) the concrete will prevent the penetration of water into the space behind the shotcrete. In order to assess the selected alternative from the economic point of view, the cost and amount of the volume changes in the initial and proposed plans were compared in accordance with Fig. 11. As seen, the excavations and installation of soil nails and rock bolts were completely removed in the proposed alternative. As seen, about half of the construction costs of the outlet portal correspond to soil nailing. On the other hand, the cut volume of soil was increased due to the decrease of benches slope. So, due to the less effects of the weather conditions inside the tunnel, such an increase is justifiable. In spite of the decrease in the thickness of the shotcrete comparing to the initial plan, due to the decrease in the slope of the benches, the volume of shotcrete is also higher. If the value engineering methodology was carried out prior to the bidding and tender procedure, the cost reduction resulting from the optimization of the plan could be much greater. Because costs can be further reduced at the study phase on account of higher creativity and maneuverability at that phase. The implementation of the above plan and monitoring of the proposed plan after three years, as shown in Fig. 12, reflects the success of the value engineering procedure carried out in the outlet portal. By changing the dip of side slopes from 3:2 to 1:1, the safety factor was increased from 1.27 to 2.48. By implementing the value engineering procedure, the cost and construction duration of the project was reduced to 2.4 million USD and 6 months respectively. Concreting of berms is a suitable method to prevent the penetration of water into the space behind the shotcrete, and to have the benches integrated against the imposed forces. Excavation and installation of soil nailing is one of the most costly items in the stabilization of the slopes. It is suggested that, if there is enough space, the slope of the benches be decreased to minimize the soil nailing quantity. AD, AHS and RHF conceived of the presented idea, carried out the simulations and wrote the manuscript. QK developed the theory and value engineering flowchart. AM performed the experiments. SZ verified the analytical methods and he supervised the findings of this work. All authors discussed the results and contributed to the final manuscript.